Thum! Kaun Aata Hai? : PLA's Chumar Incursion Ends, But Is All Well Along LAC? PLA's Chumar Incursion Ends, But Is All Well Along LAC? A 20-day stand-off between Indian Army (IA) and PLA toops ended amicably on September 30, 2014. Chinese Foreign Ministry said in a press release, "On Sept. 30, the frontier defense troops of the two countries completed simultaneous withdrawal according to the steps formulated by the two sides and restored peace and tranquility in the area." The press release added that the two sides will continue to communicate on issues relating to maintaining peace and tranquility of the border areas through the China-India border consultation and coordination mechanism, In diplomatic parlance, the press release said there are contentious issues still to be resolved, but through talks, not troop deployments. India's External Affairs Ministry confirmed on Tuesday, September 30, 2014 that both sides "carried out disengagement and redeployment of border troops" on September 26 and 27. The troops were back in positions that they occupied on on September 1, 2014. “The two sides have also agreed that a meeting of the Working Mechanism for Consultation and Coordination on India-China Border Affairs (WMCC) will be convened in India on October 16-17 to discuss various issues pertaining to the maintenance of peace and tranquility in the border areas,” the statement said. Confounding enough, the stand-off, perhaps the most contentious so far, occurred during Chinese President Xi Jinping's visit to India on September 16 through September 18, 2014. There were actually two stand-offs - in the Chumar and Demchok sectors. The Chumar stand-off was the more serious one, involving hundreds of troops from both sides. Going by TOI reporting, which was more insightful than reporting by other news outlets, PLA troops entered Indian controlled territory in Chumar on September 10, 2014 after Indian soldiers prevented PLA troops equipped with cranes, bulldozers and other equipment from building a road right up to Chepzi on the LAC. During flag meetings called to resolve the incursion, PLA commanders said that their troops would withdraw only if Indian troops pulled down a tin shed bunker that they had constructed in what was disputed territory. The Demchok sector incursion occurred five days before the Chumar faceoff, when Chinese nomads pitched their tents nearly 500-m deep into Indian territory around Ninglung Nullah, to prevent Indian workers from building a water irrigation channel under the NREGA scheme. A detailed push-by-push / day-by-day account of the Chumar incursion is appended below. On September 25, 2014 Indian Foreign Minister Sushma Swaraj announced that she had met the Chinese foreign minister on the sidelines of the UN General Assembly session and the two countries have reached an agreement to withdraw their troops by September 30 to positions that they occupied on September 1. She did not state what else was agreed to during the meeting. Going by a TOI report, it was India which blinked by agreeing to dismantle the contentious tin shed bunker and agreeing not to build more as a quid-pro-qua for PLA withdrawal. The TOI report is corroborated by the following circumstantial evidence. The agreement between the foreign ministers of the two countries entailed restoration of the status as it existed on September 1. Why? According to the Indian press PLA incursion in Chumar started on September 10 and in Demchok around 5 days earlier. A logical explanation is that there were transgression even before. Why else would the two sides agree to restore status quo ante as on September 1? Did the earlier transgression(s) involve Indian troops constructing tin sheds / bunkers in disputed territory? Was the PLA incursion provoked? In Chumar by construction of tin sheds? In Demchok, perhaps by the building of a canal in close proximity of the LAC? After all, an irrigation canal in close proximity of the border does have military significance. Why does the Army repeatedly build bunkers or cover them with tin sheds? Yes, I can appreciate that our patrolling troops need every bit of warmth during their overnight rest, but then the structures are construed by the PLA as violation of the agreement not to build any infrastructure in disputed territory. How do patrolling PLA troops manage to survive the chilly nights without shelters? Surely, this is a matter that can be resolved through discussion or circumvented through better equipment. If the bunkers / tin sheds constructed by the IA are not in disputed territory, why does the IA repeatedly agree to dismantle them? I don't know the answers, but I do consider the questions legitimate? Around 300 Chinese troops entered Indian territory where they were confronted by a group of around 100 soldiers from the Army and the ITBP. China is constructing a road close to the LAC in the sector and the Indian Army has objected to the constructions since it's perceived to be within Indian territory. Under an agreement between the two sides, any country indulging in defense construction has to inform the other side. Initially, it was believed that the PLA was engineering a face off to divert attention of India from the road construction work being undertaken on their side. A Brigadier level flag meeting at Spanggur Gap failed to resolve the crisis. It was decided to hold a follow-up meeting on Wednesday. Some of the Chinese troops returned on Tuesday and it was generally expected that the others would also retreat to their side of the perceived LAC. Two flag meetings were held, but they failed to resolve the imbroglio. 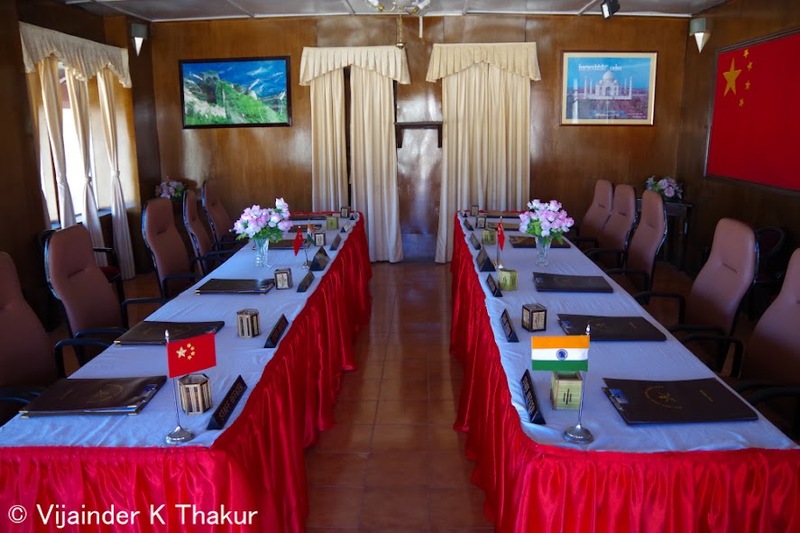 India and China held two Brigadier level flag meetings at the border personnel meeting point in Chushul to discuss the situation. The flag meetings were inconclusive. The intrusion of Chinese civilians in the Demchok area was also discussed during the meetings. As many as 100 PLA soldiers arrived from a hillock of Chumar area even as the flag meeting were on, bringing the total number of PLA troops within Indian territory to 350. The fresh intrusions took place just a few hours ahead of Chinese President Xi Jinping's arrival in India on a state visit. India also rushed some more troops in the area and both sides indulged in repeated banner drill. Chinese troops started withdrawing from Indian territory in the Chumar area from 9:45pm on Thursday. Indian Army which was present in large number in the area also started simultaneously reducing their presence. NDTV reported that Chinese troops had started to withdraw on Friday after President Modi took up the incursion with President Xi for the second time on Friday during a restricted level meeting between the two delegations that lasted 3 hours. TOI journalist Rajat Pandit tweeted late Friday that there had been no PLA withdrawal. A print report datelined Saturday said that despite President Xi's assurances, there had been no withdrawal by the PLA. The report quoted MoD sources as saying, there was "no change in the ground situation" till Friday evening at Chumar, where around 1,000 soldiers from each side are holding five to six "tactical positions" spread along a 2.5-km front in sub-zero temperatures at an altitude of around 14,500-ft.
"The PLA troops have weaker tactical positions which are difficult to sustain in the sector. They may withdraw after posturing for another day or two to save face. If they do, we will also thin out our troops in the sector to restore status quo ante. Till then, our soldiers will stand firm," said a source. PLA and Indian troop are positioned between 200-m to 800-m at different points and there is no threat of the situation spiraling out of control. A PLA lieutenant inadvertently strayed into Indian positions during the ongoing Chumar faceoff. "He was detained and later handed over to the PLA," said a source. According to the TOI report, three flag meetings between local military commanders had failed to resolve the deadlock. Two days ago both sides had brought in troop reinforcements and inducted helicopters to airdrop food and supplies for their soldiers and keep a watch around the disputed area. According to The Indian Express, no PLA withdrawal occurred on Friday as reported in the press, instead opposing troops had "adjusted to logistically convenient” positions within the same area. According to The Tribune, Army’s Kiari-based 70 Brigade at Chumar and Demchok has been advised by Army headquarters to hold its existing positions on the high mountain pass named ‘30-R’ and around it till the PLA withdraws across the LAC to its own areas of Chepzi (Zhipuqi-Quebusi). COAS General Dalbir Singh Suhag met Prime Minister Narendra Modi and presented all options to him. Senior Army officers briefed officials at the MoD. The 35-odd PLA soldiers who had intruded into Indian territory on Friday remained put for the second consecutive day, with Chinese helicopters air dropping food packets for them. Additionally, over 50 Chinese troops entered the Chumar area on Saturday at a point different from Friday's intrusion. The Chinese soldiers immediately alighted from the vehicles and positioned themselves barely 100-m away from the Indian Army, which had decided not to withdraw completely from the region even after the Chinese PLA had returned on their own to their side on Thursday night. As a result of the fresh intrusions, the Indian Army halted its cautious withdrawal and started pitching their tents again for possible stand-off. The PTI reported that PLA troops, who had arrived on Saturday, started pitching seven tents on Sunday well within the Indian territory, ignoring warnings by the Indian Army to vacate the area. The TOI reported that till Sunday evening around 1,000 PLA troops were still occupying six to seven tactical positions in the Chumar sector. "Some of them often re-position themselves for better logistics. A few return to their administrative bases in the rear for the night, and then come back in the morning. It's a well-planned operation by PLA, which has never set up camps in the area before," a source told the TOI. Over 1,000 Indian troops are keeping a close watch on the PLA soldiers, creating a situation that is "fluid but not tense" since such cat-and-mouse games are common place in the sector. The Army and ITBP have intensified patrolling along the entire LAC and 15 battalions earmarked for defense of the sector have been put on high alert. According to the TOI, "there are four battalions each under the 70 Brigade at Kiari and the 114 Brigade at Tangtse, as also five units of the Ladakh Scouts. The 14 Corps at Leh, which looks after the Kargil sector as well as eastern Ladakh, also has the 81 Brigade as "a reserve formation", which can swiftly be deployed towards Kargil or eastern Ladakh when required." The TOI revealed that Indian forces had to make a tactical retreat 2-km into Indian territory at one of the eight places of standoff in Chumar three days ago in the face of aggressive and heavy Chinese troop buildup. More reinforcements were sent later and troops are now holding position. Sources told the TOI that the standoff continued as China wasn't ready to cease its road-construction near the border and India was refusing to dismantle structures it has built near the LAC. Army chief General Dalbir Singh Suhag has called off is 3-day visit to Bhutan as PLA troops are holding positions despite diplomatic lobbying. On Monday it was reported that Chinese president Xi Jinping reshuffled the top positions in the People's Liberation Army promoting three generals known to be close to him. The president also admonished PLA brass at a meeting on Sunday, September 2014 attended by Fang Fenghui, chief of the PLA general staff. Xinhua news agency carried an official statement that said, "All PLA forces should follow the instructions of President Xi Jinping, also chairman of the Central Military Commission (CMC), and update their operations to meet new goals and missions set by the CMC." The statement also talked about the need "to improve the efficiency of military command under new circumstances". Xi also emphasized the need for "streamlining the operational headquarters of all PLA forces" with revised protocols. "The meeting focused on streamlining the operational headquarters of all PLA forces with information technology and revised several important protocols," the statement said. Chinese foreign ministry spokeswoman Hua Chunyin said on Monday that there was no need to have "unnecessary suspicion" on both sides on the border issue. Leaders of the two countries have "reached an important consensus on politically resolving the border issue through friendly mechanism. The PLA wants Indian troops to demolish a recently-built hut at Tible in the Chumar sector. The Indian Army believes the PLA has clearlu violated the 2005 border protocol by attempting to extend the road ahead of Chepzi into the Chumar sector. "The PLA troops were constructing the road in the disputed area, where soldiers from both sides patrol but do not hold positions. We will not budge from the site till the PLA troops withdraw," a source told the TOI. "Informal parleys" between the rival troops on the ground are also intermittently taking place. India is in no hurry to concede to the PLA request for a fourth flag meeting. A top-level group, which includes national security advisor Ajit Doval, Army chief General Dalbir Singh Suhag and representatives from the foreign ministry, intelligence agencies and ITBP, among others, is debating the PLA request. PM Narendra Modi is expected to be briefed on the face-off on Wednesday. Till Tuesday evening, there was no change in the ground situation, tactically or numerically," said a source. “It is our territory, we will push them back,” minister of state for home affairs Kiren Rijiju said today. The demarche — an official document exchanged between governments typically communicating a concern or a protest — was issued both in New Delhi and Beijing over the past two days, a senior foreign ministry official told The Telegraph. According to the Indian Express, Army Officials had yet to respond to the two day old PLA request for a flag meeting because the face-off had already escalated to diplomatic channels. The Indian Express also reported that India is going to propose a mutual withdrawal in the next flag meeting, to prevent any escalation on account of the massive troop build-up in the area. Chinese ambassador Le Yucheng reportedly visited South Block for talks with senior officials of the external affairs ministry. Source told TOI that the ambassador was not "summoned" for lodging of any protest. Around 150-200 Chinese soldiers pulled back from the 30-R position since Tuesday afternoon. A Major General level flag meeting, the fourth to resolve the imbroglio, was held at the Spanggur Gap border meeting point. An agreement was reached whereby the PLA will not extend the road it was trying to construct in the "disputed area" ahead of Chepzi towards Chumar, and in turn India will demolish the recently-built observation hut at Tible in the sector and refrain from building bunkers there in order to restore the pre-September 10 status quo. The two armies worked out the modalities to complete the troop pullbacks by Saturday evening. Indian Foreign Minister Sushma Swaraj announced that she had met the Chinese foreign minister on the sidelines of the UN General Assembly session and the two countries reached an agreement to withdraw their troops by September 30 to positions that they occupied on September 1. She did not state what else was agreed to during the meeting. The two sides will continue to communicate on issues relating to maintaining peace and tranquility of the border areas through the China-India border consultation and coordination mechanism, the press release added, perhaps hinting that points of contention still existed. “The two sides have also agreed that a meeting of the Working Mechanism for Consultation and Coordination on India-China Border Affairs (WMCC) will be convened in India on October 16-17 to discuss various issues pertaining to the maintenance of peace and tranquillity in the border areas,” the statement said. In a flag meeting on Tuesday at the Spanggur Gap, PLA and IA confirmed that both sides had withdrawn as per the plan agreed in the earlier flag meeting. Chumar is located in J&K, more than 300-km south east of Leh, close to the border of Himachal Pradesh. The area, where heights vary from 12,000 to 15,000 feet, has been a flash point between the two sides with Chinese making several attempts to end India's dominance in the area by claiming it as Chinese territory. There have been several face-offs in the last two-three years. Position 30-R in Chumar is a hillock at an altitude of about 14,500-ft which is 30-m higher than its surroundings.